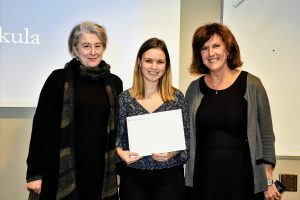 Congratulations to the recipients of the 2019 OT2 awards, recognizing outstanding merit in the MScOT program. The awards were given on January 31. This award recognizes the student who obtained the highest standing in the first year of the program. This year’s recipient is Martina Sykula. 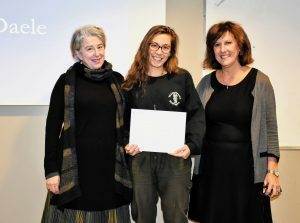 This award recognizes Ms. Robinson’s (Director of OT Program, 1967-1981) contribution to U of T, and is presented to the student who obtains high academic standing in the first year of the program with strong fieldwork evaluations. This year’s recipient is Laura van Daele. This award will be given to a student in the Department who demonstrates socially conscious contributions to the University community. 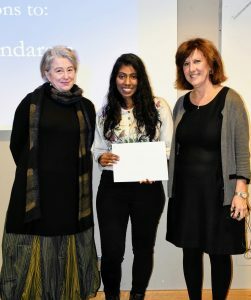 This year’s recipient is Janany Jeyasundaram. This award supports new research in occupational science and occupational therapy, focused on mental health, developmental delay, caregiving, community integration, cognitive assessments and interventions, environmental adaptations, translating research evidence into practice, or examining how the health and social systems can meet complex needs. 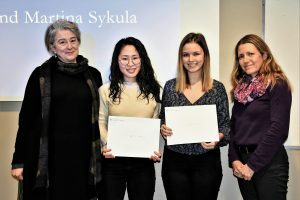 This year’s recipients are Amy Yang and Martina Sykula. This entry was posted in news archive on February 20, 2019 by comm.